Are you are creating the right social opportunities for your tot? And is playing at the park enough? Or should you enroll your toddler in some enrichment programs? So many of my friends here think that getting their kids into social groups, where they have "circle time" and learn to play together, etc., is really important. I'm starting to wonder if my son would be missing out if his only social interaction is at the park. 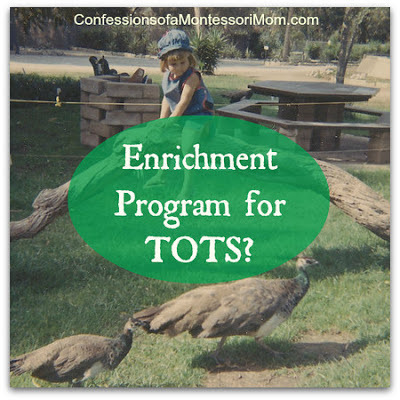 People [here] are crazy about all sorts of "enrichment" programs and classes for babies and toddlers, and while I think the enrichment idea is hogwash, we have joined some weekly classes merely for the opportunity to meet other moms and babies. However, most of our friends are now entering half-day playgroups or nursery schools, which means they aren't as available for play dates at the park, etc. I'm looking for advice on the social needs of kids under two. How important is it that he be in structured social situations vs. mostly at home with me with some social free play? When my son was 18-months-old he started a local daycare called Early Headstart. This decision was for my son who was born with Down syndrome: he had no siblings and I knew he needed to be around other children to aid in his development--within six weeks of going to this daycare he started walking. When he turned three he left the program (which only went to age three) and started a Montessori toddler program two or three mornings a week. He also went to an in-home daycare so I could work at home and so he could be around other children: my son is very social! He needs to be around other children! Tots can be fine at home, and they can be fine in a daycare: your tot will not be smarter for going to daycare, necessarily, or less smart for not being in a daycare program. But it should not be about raising the next Mozart or Picasso! Did they go to daycare or enrichment programs when they were infants? Would it have mattered? As for the toddler year (age 24-36 months), being in a daycare can help your toddler learn basic social skills and school routines (having snack in a group, sitting in a circle for songs and stories, learning to take turns, etc.). And not all toddlers have to go to a daycare program, many moms keep their toddler at home one more year (and then decide on preschool). This can be for financial reasons or because the toddler is happy at home (and so is the mom!). How important is it that your tot be in structured social situations vs. mostly at home with you with some social free play? That depends on you and what makes you happy and sane! Some children do fine at home and the moms are happy! Other moms are miserable and need that time away from their children; and or the mom discovers her child would be happier in a daycare setting part time. Each situation is different! But again, it should not depend on the need for "enrichment." Notice how I hardly mentioned Montessori? That is secondary, secondary to your happiness as a mom, and your tot's happiness! If you think you would be happy (and sane) keeping your tot at home, and your tot is happy and content being home alone with you, knowing you will have more of a challenge connecting with other moms and children, than keep your tot home. But if you feel you need some time for yourself and a break from your tot (some tots are easy, others are a HANDFUL--like mine was--OH BOY!) and or if you think your tot would be happy (or happier) around other tots, and or you really need to stay connected with other moms and the only way to do it is to enroll your tot in daycare, then give it a try two or three half days a week. Some of the best children we had in our Montessori preschool were those who never went to a daycare! So don't let that be the ONLY reason!